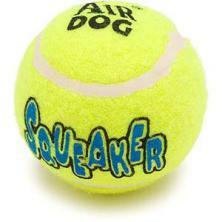 The Air Dog Squeaker tested LOW for harmful chemicals. When you buy a bed or food bowls or toys for your pets, you believe that they are safe. Or maybe you just hope they are not harmful, depending on how skeptical you are. Perhaps you assume that the government would have recalled a product if it were not healthy for your pet. Maybe it would, if the government tested all products, but it doesn't. Who will? Who does? A non-profit agency that has tested chemical levels in pet products, as well as various products for kids and adults, has just gone live with its findings on more than 900 products this week. The Ecology Center is Michigan-based, but it works at local, state, and national levels to keep production clean, communities healthy, the environment preserved, and the future sustainable. Play N Squeak Batting Practice Tested HIGH for chemicals. The Ecology Center has set up a new organization, HealthyStuff.org., which has received funding from the charitable arms of corporations as well as individual members who care about the safety of their relatives and pets (like us!). What HealthyStuff.org has already done is test more than 900 widely-available products for chemicals such as lead, chlorine, cadmium, arsenic, mercury, bromine and other chemicals that pose a threat to communities that manufacture them, as well as to the purchaser, the user, and the communities where these products are eventually dumped. HealthyStuff.org rates the products on the relative amount of chemicals according to NONE, LOW, MEDIUM, and HIGH. You may be shocked when you see that there are pet beds, pet bowls. and pet toys that contain these harmful chemicals. 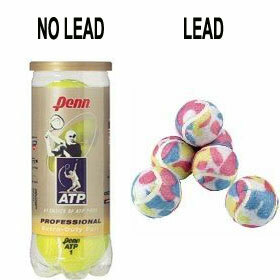 I did a random search on tennis balls, and I learned that there are no chemicals in the Penn ATP Professional Extra Duty tennis balls, made for humans, but among the balls made for dogs, there is a MEDIUM level of chemicals in Gizmo Tennis Balls for Dogs and PetSmart's ToyShoppe Playables Tennis Balls. And there is a HIGH level of chemicals in Pet Supplies Plus Tennis Balls, particularly in lead, arsenic, and chromium. Disgusted? 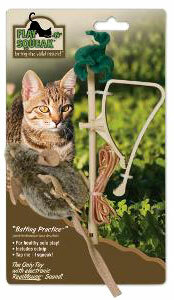 Cat toys? You have to watch out for those too. The Play N Squeak Batting Practice and Twice the Mice tested HIGH. Even collars for dogs and cats tested MEDIUM to HIGH for toxic chemicals. HIGH chemical content in the Coolaroo Pet Bed Another random sampling... 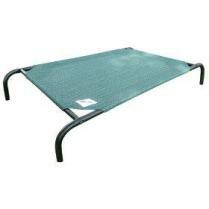 The Coleman Classic Rectangular Bed for Dogs (Small) tested HIGH for dangerous chemicals, as did the Coolaroo Pet Bed. MEDIUM levels of chemicals were found in the Fur Haven Nap Pet Beds Bolster and in the Majestic Pet Extra Large 52" Bagel Donut Dog Pet Bed. Had enough yet? Some cat beds or cages were also found to contain LOW or MEDIUM amounts of chemicals. 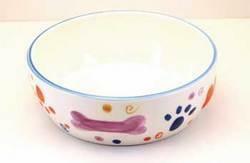 Better to stay away from painted bowls, unless you have test results Now, you would think that manufacturers would be especially careful about pet feeding and water bowls. I hate to disappoint you. Ethical Products (sic) Spot Party Animal 6" Dish for Dogs tested HIGH. Don't let company or product names deceive you, and watch out for painted bowls. The well-advertised Le Bistro even turned out to have MEDIUM levels of bad chemicals. Le Bistro checked out with MEDIUM levels of chemical toxins. 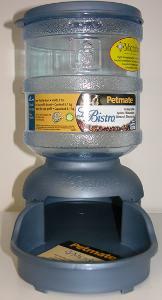 There are dozens more pet products rated for chemical content and even more to come. Now that HealthyStuff is providing this information, I'm going to check out everything I'm even thinking of purchasing on the site... even my clothing! Also, HealthyStuff.org lets you vote on which additional products you would like them to test. I'm really impressed with the whole website and the extent to which it has gone to bring so much information to the consumer. The site is extremely easy to navigate... you can look up products by type, by brand name, or by the levels of chemicals the tests have shown. Go for it. And make a contribution to this non-profit group, especially if you think you will be using the site for pet products or for just stuff!